one of the most exciting things about working in this industry is free beauty products. i felt that way when i was 18 and a Vogue intern who used to do several giveaway table drive-bys in a single afternoon and i feel the same way now, almost 10 years later (i’m turning 28 on saturday.. WHATWHAT!). so imagine my delight (ecstasy!) the other day when my producer picked through her massive, messengered shopping bag from a very well-known magazine and dropped it on my desk. “take what you want and pass it on,” she said. after suppressing the mortifying urge to take it all and just RUN, i selected a few choice items. the first thing i grabbed was this Boscia BB cream, especially after reading this rave review on xojane. this cream is out of this world good. it’s the most moisturizing thing on this planet with absolutely NO oily tendencies. it only comes in one color but it magically made my skin tone unbelievably even and supple-looking. when i walked into my shoot this morning the first person i saw asked me if i went away for a long weekend somewhere warm. which, honestly, is the best compliment you can get about your appearance. 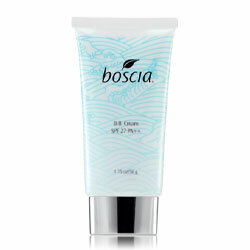 if you buy anything new for your make-up bag this season, make it this boscia bb cream. if you don’t, you’ll miss out on having the smoothest, most velvety, silky skin you ever thought you could have and you’ll obsess over it day in and day out until you finally DO buy it, and then you’ll thank me for turning your whole world upside-down.